Emergency car hammer to break glass in emergency. 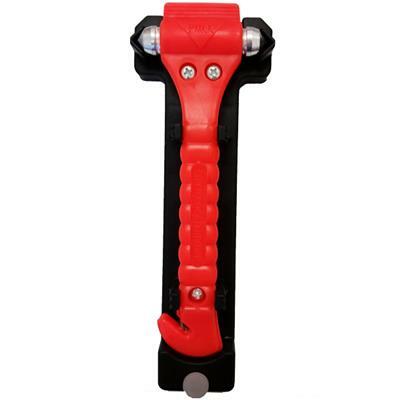 Use this Emergency Auto Hammer to quickly escape from your vehicle, even under water, should your door become jammed or inoperable in an emergency. After an automobile accident, bridge or road collapse, earthquake, hurricane, tornado, winter storm, tsunami, flood, or other disaster, you may find your door stuck and need to quickly extricate yourself or your loved ones from your vehicle. 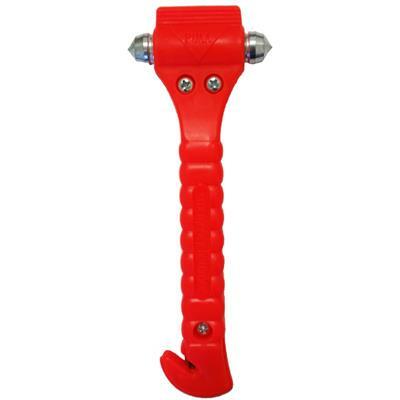 Due to gas leaks (possible explosions) or rising water (possible drowning) you need to have an emergency auto hammer handy so you can break the window of the car using its dual-sided, nickel-plated hammer tip and cut through seat belts using the stainless steel razor-sharp blade. It also includes other potentially life-saving features such as built-in emergency flashlight, a glow-in-the dark locator, and more. Dimensions: 3.75" x 1.75" x 9"
Seat Belt Cutting Razor / Safe and easy to use by both adults and children. Made of ABS military standard plastic casing. Instructions: Use the razor-sharp blade to slice through your seat belt. Swing the auto hammer towards the side window to break the glass by striking it with 1 of the 2 nickel plated carbon tips.